On this website you can find information regarding the E&E Congresses, the E&E Event 2018 in Berlin and the AsphaltAdvantages campaign. These activities are organised by Foundation Eurasphalt on behalf of the European Asphalt Pavement Association (EAPA) and the European Bitumen Association (Eurobitume). 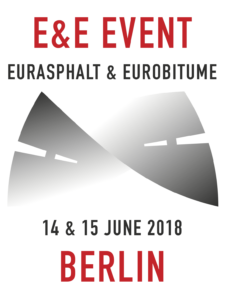 The 1st E&E Event was held on 14 and 15 June 2018 in Berlin. The next E&E Congress will be held on 12 – 14 May 2020 in Madrid. The Asphalt Advantages online campaign, which has been launched jointly by European Asphalt Pavement Association (EAPA) and Eurobitume in October 2014, has recently made the website available in another language. Next to English, German, French, and Turkish, the Slovenian language has been added, and work on a Spanish translation is in progress.